François Ozon (French: [fʁɑ̃.swa o.zɔ̃]; born 15 November 1967) is a French film director and screenwriter whose films are usually characterized by sharp satirical wit and a freewheeling view on human sexuality. He has achieved international acclaim for his films 8 femmes (2002) and Swimming Pool (2003). Ozon is considered to be one of the most important French film directors in the new "New Wave" in French cinema such as Jean-Paul Civeyrac, Philippe Ramos, and Yves Caumon, as well as a group of French filmmakers associated with a "cinema du corps/cinema of the body". Ozon was born in Paris, France. 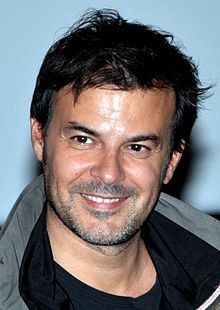 Having studied directing at the French film school La Femis, Ozon made several short films such as A Summer Dress (Une robe d'été, 1996) and Scènes de lit (1998). His motion picture directing debut was Sitcom (also 1998), which was well received by both critics and audiences. After the Fassbinder adaptation Water Drops on Burning Rocks (Gouttes d'eau sur pierres brûlantes, 2000) came the film which made his name outside France, 8 Women (8 femmes, 2002), starring Catherine Deneuve, Fanny Ardant, Isabelle Huppert and Emmanuelle Béart. With its quirky mix of musical numbers and murder mystery and a production design harking back to 1950s Hollywood melodramas such as those directed by Douglas Sirk, the film became a huge commercial success. In 2003, Swimming Pool, which starred Charlotte Rampling and Ludivine Sagnier was released. It was considered by Ozon as a very personal film that gives insight into the difficult process of writing a novel or screenplay. In 2004 he directed the film 5x2. In 2005 his film Time to Leave (Le Temps qui reste) was screened at various film festivals worldwide. Ozon's first full English-language production Angel, starring Romola Garai, was released in early 2007. The film, based on a novel by British writer Elizabeth Taylor, follows the story of a poor girl who climbs Edwardian England's social ladder by becoming a romance writer. The film was shot at Tyntesfield House and Estate near Bristol, at other UK locations and in Belgium. While filming Angel, Ozon developed a strong friendship with Garai and called her his "muse". His film The Refuge had its world premiere at the Toronto International Film Festival in September 2009. On 19 December 2011 Ozon was announced as being on the jury for the 62nd Berlin International Film Festival, which was held in February 2012. His 2013 film Young & Beautiful (Jeune & Jolie) was nominated for the Palme d'Or at the 2013 Cannes Film Festival. Ozon was elected as best screenwriter at the 2013 European Film Awards for his 2012 film In the House. His 2014 film, The New Girlfriend, premiered at the Toronto International Film Festival in September 2014. Sébastien Charles plays the lover of the main character in A Summer Dress, has appeared in other Ozon movies (Les puceaux, Scènes de lit and Sitcom) and choreographed 5x2, 8 Women, Water Drops on Burning Rocks and A Summer Dress. Sasha Hails appears in Ozon's short films Une rose entre nous and See the Sea (along with her real-life daughter Samantha). François Delaive appears in three Ozon's short films Thomas reconstituté, Little Death, and in one of the segments of Scènes de lit. Marina de Van plays in Sitcom and See the Sea and co-wrote Under the Sand and 8 Women, as well as the poem "Bouche de Saïd" from Criminal Lovers. Charlotte Rampling plays in Swimming Pool, Under the Sand, Angel and Young & Beautiful. Ludivine Sagnier plays in three movies: Water Drops on Burning Rocks, 8 Women, Swimming Pool. Lucia Sanchez plays in three movies: A Summer Dress, Scènes de lit, Sitcom. Valeria Bruni Tedeschi is in Time to Leave and 5x2. Melvil Poupaud is in both Time to Leave and The Refuge. Fabrice Luchini is in Potiche and In the House. Sergi López appears in Ricky and briefly in Potiche. Marine Vacth is in Young & Beautiful and L'amant double. ^ Palmer, Tim "Style and Sensation in the Contemporary French Cinema of the Body", Journal of Film and Video, Fall 2006 "Archived copy" (PDF). Archived from the original (PDF) on 2010-06-02. Retrieved 2010-05-17. CS1 maint: Archived copy as title (link) Access date: 14 May 2010. ^ "Berlinale 2012: International Jury". berlinale.de. 2011-12-19. Retrieved 2011-12-21. ^ "Toronto film festival 2014 unveils first wave; Little Chaos to close". Screendaily. Retrieved 22 July 2014. Wikimedia Commons has media related to François Ozon.